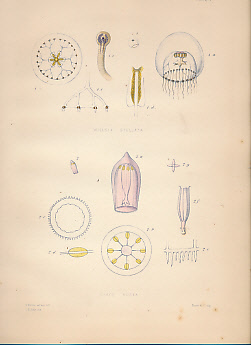 Barter Books : Forbes, Edward : A Monograph of the British Naked-Eyed Medusae: With Figures of All the Species. 360 x 260 mm (14 x 10 inches) - 104pp, + plates. G : in Good condition. Cover rubbed with corner wear. Lower part of outer spine missing. Scattered browning. Plate 9 with some light spotting, otherwise illustrations bright. Ex.-lib. Royal College of Surgeons with minimal marking.